The taoiseach (Irish prime minister) has said he feels that Britain will not leave the EU without a deal at the end of March. Leo Varadkar spoke to reporters ahead of a meeting with Theresa May at the EU-Arab League joint summit in Egypt. He described a no-deal Brexit as a "lose-lose-lose scenario for everyone". He said he believed the UK would either agree a deal with the EU or that Article 50 would be extended rather than a no-deal outcome. What does Ireland do if there's no deal? The UK is due to leave the European Union on 29 March. 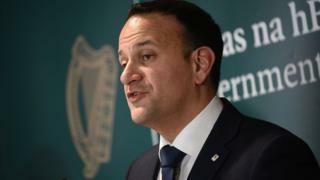 Mr Varadkar said: "A long extension creates a complication in relation to the European elections, but that's a small complication relative to the impact on our economy. "A lot of colleagues feel if there is an extension it should be an extension with a plan, rather than an extension just to continue negotiations which have gone on for almost two years. "I feel that the chances are that that won't happen and that we will either have a deal that is ratified or that we will have an extension." Irish Tánaiste (Deputy Prime Minister), Simon Coveney, said on Monday that the Republic of Ireland would not veto any UK request to delay Brexit. However, he added that it would be a request that the EU "collectively has to consider". Mrs May is facing growing calls to say she would delay Brexit rather than leave the EU if no deal is in place by the end of March. A new plan from some Tory MPs suggests ministers postpone Brexit until 23 May "to conclude negotiations". Mrs May said on Monday that it was "within our grasp" for the UK to leave the EU with a deal on 29 March. "Any extension of Article 50 isn't addressing the issues," she said. "We have it within our grasp. "I've had a real sense from the meetings I've had here and the conversations I've had in recent days that we can achieve that deal." The meeting between the taoiseach and the prime minister follows Mrs May's decision to delay Wednesday's vote on the Withdrawal Agreement until 12 March, 17 days before Britain is due to leave the European Union. But many MPs had wanted another so-called "meaningful vote" sooner than that, and Labour leader Jeremy Corbyn suggested Mrs May was "running down the clock" until a time when MPs were forced "to choose between her bad deal and a disastrous no deal". What preparations are being made for no-deal? On Sunday the taoiseach would not be drawn on the implications of the vote deferral. He said it did not change things for the EU. "It doesn't change anything from Ireland's point of view either," he told reporters on the opening day of the EU-Arab summit. There will be further talks in Brussels on Tuesday on the Irish border backstop - the number one sticking point for many when it comes to the Brexit deal.